Is PVC Vinyl Decking a Good Solution? PVC vinyl decking is a relatively new product having only arrived around 2005. It is one of the more expensive options although long life and easy maintenance may offset the initial cost. PVC vinyl decking attracts designer homeowners because it is available in almost any colour. Moreover, it is stain resistant and the tints retain their intensity longer. What’s Inside PVC Vinyl Decking? There is no wood core inside PVC vinyl decking unlike some other wood-alternative products. Instead, it comprises an inner core covered over with an outer coating providing the finish and colour. This co-extrusion process is technically difficult. The coating may fail in up to 10% of applications. The materials can be recycled. however this does add to the cost. 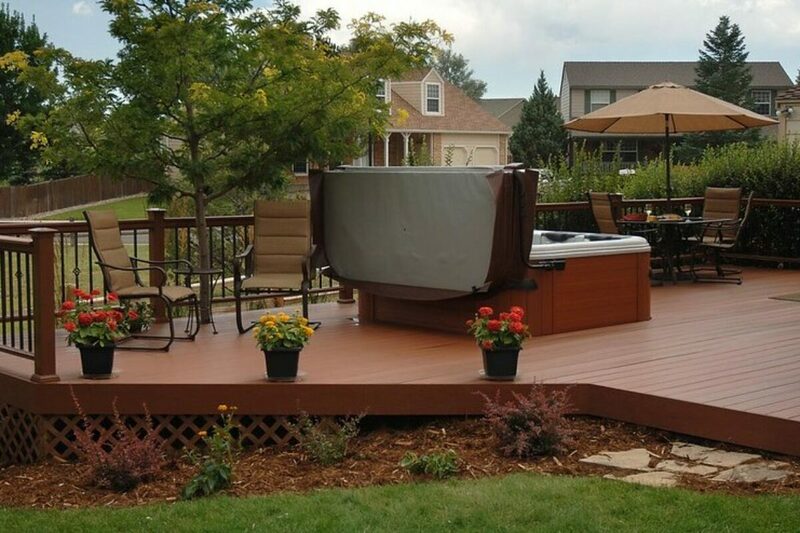 The PVC vinyl product is lighter than many other decking alternatives, low on maintenance, and easier to clean. It can also be formed to create flowing lines within limits, and other artistic patterns. Is There a Downside Over and Above Set-Up Cost? That depends. If you want to have a deck and forget about unsightly mold and grime, then PVC vinyl decking may be the right solution for you. You’ll never have to go down on your hands and knees to sand and reseal ever. Traditionalists are none the less unhappy with the overall effect, despite realistic wood graining / brushstrokes. They don’t like the artificial ‘feel’ and ‘synthetic sheen’ either. For them, natural wood is still the obvious choice. Moreover this is environmentally renewable, providing it comes from a commercial forest. Like so much else in our business the final choice is yours. Even the smartest deck material eventually gets covered over with dust and grime. Sweep the deck with a stiff broom, following the artificial grain to remove loose dirt. Now make a strong solution of dishwashing liquid. First, spray the deck using a garden hose to soften the muck. Then get down on your knees with a scrubbing brush remembering to follow the grain. Rinse the deck thoroughly and allow it to air dry. Never use a metal scrubbing brush, pressure washer or bleach on a vinyl deck because you could damage it. PVC vinyl material is more expensive, and less forgiving than traditional hardwood. Therefore this is not always a job for DIY homeowner expecting a top-rate job. Sometimes it’s better to hire a professional. Call Valiant Exteriors in Calgary at 403 829-1661 for a quote before you finally decide. We pay trade prices for our PVC vinyl decking and the job could cost less than you expect.